Any kind of tobacco smoking is addictive and harmful. According to the National Cancer Institute, or NCI, cigar smoke contains thousands of toxic and cancer-causing chemicals. There is no safe level of cigar-smoke exposure to you and those affected by secondhand smoke. Even if you're not inhaling, cigar smoking causes cancer of the lip, tongue, mouth and throat as well as the voice box, esophagus and lungs. The Mayo Clinic's Edward C. Rosenow III, M.D. reports that cigars have as much nicotine as several cigarettes, making them just as addictive, and just as difficult to quit. Pick a quit date. Let your friends and family know that you plan to quit the habit. Withdrawal symptoms include feeling irritated and annoyed. If your friends know why you are having mood swings, they're more likely to be understanding and supportive. Use nicotine replacement therapy, known as NRT. Replacement therapies like the patch, gum, lozenges and inhaler contain a small amount of nicotine, explains the Mayo Clinic. They work by reducing nicotine cravings and minimizing withdrawal symptoms. NRTs also increase your chances of kicking the habit for good. Get a prescription. Effective medications used to treat dependence on tobacco include bupropion and Chantix. Bupropion works by minimizing withdrawal symptoms. Chantix helps minimize withdrawal symptoms, but also blocks receptors in the brain, according to the Mayo Clinic. So if you do relapse, the nicotine will not stimulate receptors in your brain the way it did in the past. Join a smoking-cessation group. Nicotine Anonymous is a group of men and women that help each other live nicotine-free. The NCI offers real-time text messaging with a smoking cessation counselor. You can also call (877) 448-7848 to talk to a counselor. The Department of Defense offers programs for members of the military and their families. Keep busy. The American Cancer Society suggests frequenting places that ban smoking like museums, malls, churches or movie theaters. Spend time with supportive people. Withdrawal symptoms are more likely to occur, or will feel worse, when you're alone. Cigar smoke is a major contributor to indoor pollution, according to the National Cancer Institute. 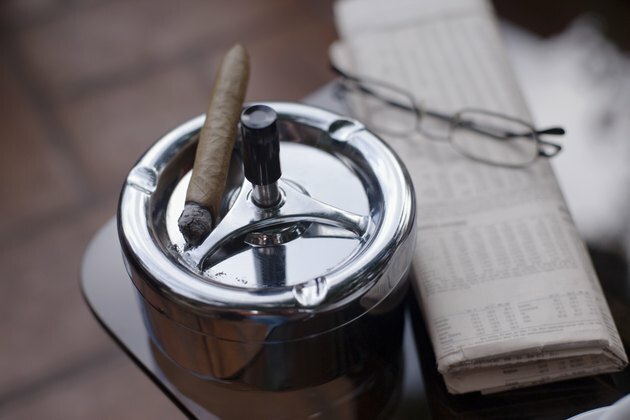 Concentration of toxins in cigar smoke is higher than in cigarette smoke. A single cigar can contain as much nicotine as a pack of cigarettes. Side effects of nicotine replacement therapy include insomnia, headaches and stomach problems. MayoClinic.com: Cigar Smoking, Safer than Cigarette Smoking? What Are Some Solutions to Smoking? How do I Stop a Smoking Cough? Are There Vitamins That Flush Nicotine?